Back-Up Story: "The Origin of Metamorpho: The Element Man"
Renee Montoya and the Question arrive in Kahndaq to pursue their investigation of Kahndaq's suspected connection to Intergang. In Metropolis Dr. Kala Avasti visits John Henry Irons, who hasn't been heard from in a month. Irons is still an emotional wreck over his niece's decision to receive super powers from Lex Luthor. Irons has finished a suit Natasha could have worn but feels it is too little too late. Elsewhere Dr. Will Magnus receives a visit from government officials who wish to buy the Metal Men from him. Magnus refuses despite veiled their veiled threats. Afterwards he visits Dr. T.O. Morrow only to find the "mad scientist" has escaped. Morrow left Magnus a note which contains a string of numbers that Magnus recognizes as machine code. After twenty hours of sleep Montoya and the Question check out a lead that a friend of the Question had given him. After tracking down the location the two discover a room full of bodies. After a short investigation they leave and are immediately arrested. Back in the States the machine code Morrow left for Will Magnus allows the scientist to finally revive Mercury of the Metal Men. "The Origin of Metamorpho: The Element Man"
Rex Mason, adventurer, hopes to attain the fortune that will allow him to marry the woman of his dreams. Betrayed, Mason is trapped and exposed to a strange form of radiation, which transforms him into Metamorpho, the Element Man. With the ability to shift effortlessly from gas to solid to liquid Mason continued his travels in search of thrills and excitement. Main Story - 4: The strength of this issue was not on action but intrigue. The bits of story were enjoyable on their own but played well into the ongoing narrative. For the first time I'm really interested in what is going with Will Magnus, so there's that to be happy about. I also enjoyed the fact that instead of having small snippets over the course of the week the writers gave us two solid days worth of events. The Montoya/Question aspect was excellent. My interest here has always been with what is driving Montoya at this point in her life. Greg Rucka and Ed Brubaker made me care about Renee. I've actually liked the character since the Chuck Dixon days and it is interesting to see a character from Batman: The Animated Series come this far. Beyond that I liked how the writers are exploring the differences in how the rest of the world sees Adam and how his own people view him. The perceived barbarism compared to the feeling in the hearts of the people is great and gives this part of the story some real depth. The dark humor at the end with Renee wondering what day it is was a great touch. The Magnus arc is picking up steam as well. I've never been the biggest Metal Men fan but there is something appealing about them. The escape of T.O. Morrow, the government threatening Magnus and Mercury's resurrection were all interesting. The Prozac angle was another attention-grabbing plot point and I'm hoping that this will be explored further. It's interesting to see that the shortest piece of the puzzle made the cover this month. 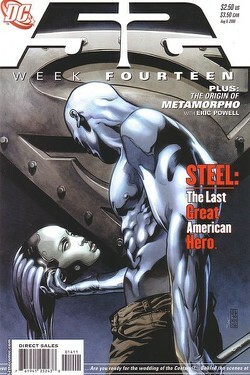 Being something of a Superman fan the Steel plot holds a lot of interest. John Henry has gotten the short end of the stick for a long time and it's great to see him take a position of prominence. He's going through a lot right now and that desperation and sadness is coming through in the writing. The fact that he finished the armor for Natasha was poignant and there is the feeling that despite him telling Kala that it was too little too late I got the sense that he thought if he finished the armor that it would bring Natasha back. Some readers seem to be a little put off by this part of the story, but it's dramatic and makes sense for the characters involved. Art - 4: There is something very creepy about Black Adam smiling in the poster at the beginning of this issue. It is strange that I can accept the man ripping people in half but grinning weirds me out. Dale Eaglesham is a fantastic artist. Like the other artists on this series he benefited from Giffen's layouts but still maintained his own look and feel. This was an interesting issue because outside of Steel, Natasha's armor, the Metal Men and possibly the Question's face he had to draw a lot of everyday backgrounds and clothing. Eaglesham hit it out of the park on this. The characters and their setting all had a great level of detail, which I always like to see. I was very impressed with the art in this issue. And I absolutely dug Natasha's armor. Backup Story - 4: It's tough to nail an origin in two pages. Despite skipping over huge chunks of Rex Mason's history the basics are given, though, and that was the point of these origin pages. Frankly I don't blame Waid on this. The character has been through a lot and then there is Shift to consider. This segment had a quirky, Silver Age feel, which made it all worthwhile for me. Art - 4: Eric Powell's art complimented the Silver Age feel the writing had to it. The art had a rough quality to it, but that fit right in with the character. I especially liked the cyclops villain in the second to last panel. Cover Art - 5: Wow. This was an awesome piece of art. This was the first cover I looked at and thought, "Man, I'd love to have the original hanging on my wall." It is a deceptively simple piece of art because of its elegance. There's a lot going on there, though. I can see the sadness and loss that John Henry is feeling. It practically jumps off the page. I also liked how the SUPERMAN RETURNS logo was worked into the piece. The bolts were a great touch. This is the first cover that I have absolutely no complaints about.